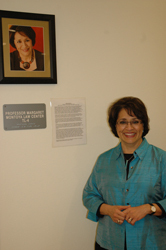 The Professor Margaret Montoya Law Center has opened its doors at Atrisco Heritage Academy (AHA) High School, a state-of-the-art college-prep facility taking shape on Albuquerque’s Southwest Mesa. In addition to the law center named for Montoya, an adjoining courtroom was named for A. Joseph Alarid, retired New Mexico Court of Appeals Judge. The law center also includes a law library. Principal Karen Sanchez-Griego and the other AHA administrators have designed and set up the law center with a goal that it will function as a law clinic with practicing lawyers and perhaps UNM law students advising the high-school students. Nationwide, pipeline projects aim to inter-connect the systems of educational institutions to stop the leakage of students, improve graduation rates and increase the numbers of students of color in post-graduate studies. Montoya has also worked with the ENLACE program, a highly successful program that emphasizes parental involvement and improved academic outcomes for students. The law center is part of the second phase of the new Atrisco Heritage Academy High School, which recently celebrated completion of a 10th-grade academy, a cafeteria, special education classrooms, gym spaces and administrative offices. When the school opened its doors in fall 2008, the UNM School of Law’s Mexican American Law Student Association, in partnership with ENLACE, pledged to work as mentors to the students. The school also houses a working bank run by the New Mexico Educators Credit Union, state-of-the-art film and video facilities, and will soon open a UNM school-based community health clinic with physicians, nurses, medical students and dentists.